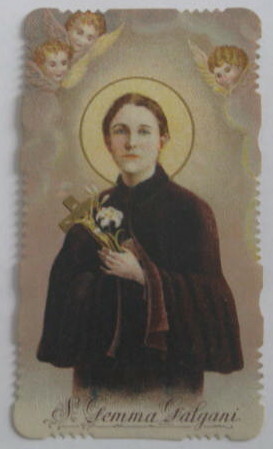 Love Triumphs in the Victim- Saint Gemma's 50 year heavenly intercession in the life of a German mystic. -The remarkable story of St.Gemma's 50 year heavenly friendship with a German mystic named Mariella. "If I say the slightest untruth, Jesus sends his representatives in order to rebuke me ruthlessly. 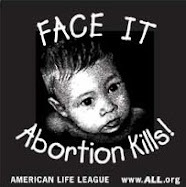 I would rather suffer all the tortures and endure all shame before men, than to not be a child of the truth. I hate lies and dishonesty and the fear of being an impostor or being decieved makes me suffer more than all the pain of the disease. I write as I am told; I write out of love for Gemma. I do not care whether it is pleasant or not, whether it is right or not. It is not from me; It would be a mistrust of Gemma if I had objections or misgivings about what I am told to write." The hidden life of the victim soul Mariella was an unbroken chain of suffering. She came from a family of nine. When she was age two she became ill with diphtheria, then scarlet fever at age 13, at age 19 she moved to her grandmothers home to assist her grandmother in caring for her pleurisy. 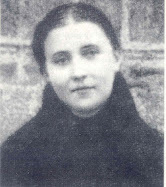 Then at age 25 she contracted black smallpox, from which she was miraculously cured through the intercession of St Gemma. However the smallpox was followed by other diseases such as intestinal tuberculosis, cystitis, uremia, a spinal cord disease and later joint rheumatism. Additionally, during the war in 1945 she was kicked in the stomach by an enemy soldier which caused a wound and subsequent tumor that took cancerous forms. In latter years this wound was bleeding every day, sometimes the blood flowed so heavily from this stomach wound that she became very weak and felt as if she would faint at any moment..
Saint Gemma came to Mariella for the first time on March 25, 1920 (Feast of the Annunciation) as she lay in the isolation room of the hospital suffering with black smallpox ("Black pox" as it is commonly known, is a symptom of smallpox that is caused by bleeding under the skin which makes the skin look charred or black). Interestingly, Black pox is close to one hundred percent fatal (see black smallpox wikpedia entry here) and because of this the doctors basically abandoned her to her fate. One of the local priests was called to her bedside and she was given the last rites of the Church. "Suddenly someone came to my bed and touched my feet. Then the apparition moved closer and touched my forehead and said:. "My sorella! [sister] Know that you were doomed to death. Wake up! The new life that you are receiving will not be a life of health and strength, but a life for the task that God has given to you; a new life in reparation, prayer and sacrifice.....I will be thy guide and sister. I am Gemma from Jesus"
"Then she waved farewell at me and disappeared. Suddenly I felt from my feet going up to my head a pleasant feeling that came over me, and then I felt no more pain, yet just before I could not even move my arms and legs.....I kept absolutely secret about this experience. No one had ever told me anything about her. If she had not given me her name I would not have known who she was. 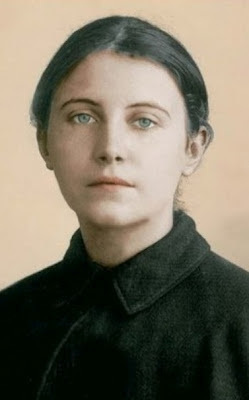 I must confess that I never heard such a name at that time and I had never venerated this servant of God, but since March 25, 1920 she was to be buried in my memory." And from that day on, for the next 50 years Gemma was to be Mariella's teacher and guide, reprimanding her at times for her willful faults and sins, but even more so encouraging her in the practice of virtue--all the while enflaming her heart with consoling words and causing her to make heroic sacrifices out of love for Jesus, and in union with Him. (It is important to point out that these are private revelations which the Church thusfar has made no judgments upon. The faithful are therefore free to discern for themselves the veracity of the alleged revelations. It should be noted that the book has received ecclesiastical approval by Josef Erhardsberger, Canon Emeritus, Regensburg, August 15, 1973). "I would like you, my sister, to rise higher in your ascent to God. 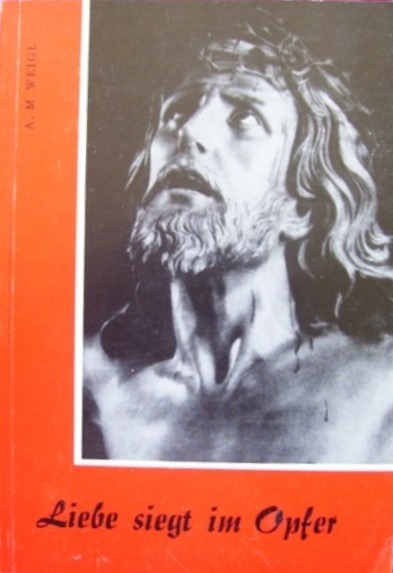 Through suffering you can work miracles--miracles not perceived by the eye, but your sufferings will obtain the conversion and salvation of human souls and will benefit also those in purgatory." "Your mission will be to suffer. 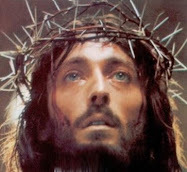 The sufferings I will send you will serve your land, for through suffering I have redeemed the world." God tests a person to whom he has intended a particular task, not with things that corresponds to his inclinations and likes, but with that which contradicts them. It is human nature to defend yourself against such things and standing up to it I have used much of my resources for medical opinions and skills, however their power was only a limited effect. God had to purify my soul in the fire of affliction and pain. He had to work with the mighty hammer of suffering in my soul, pounding like the sculptor of marble, carving his holy image upon me. The seed must first die in the ground before breaking open the real germ of life and it must then struggle towards the light. So the year 1923 was spent in suffering and sorrow. Illness for me was still the enemy. "Your whole life should be a quiet hidden life on the Cross. You shall not suffer more than before. Your mission will be love, suffering and atonement. Suffer for love united with Jesus! 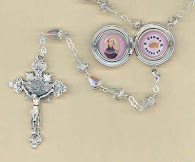 Everyday carry your little cross with love! Learn finally to accept God's holy will; subject yourself to His holy will without any struggle. Your complaints displeases the Sacred Heart of Jesus and also me." "Follow me in pain, misunderstanding and loneliness." I took the cross for a friend. I embraced it just as the Savior embraced his, as he put it on his shoulders. From then I found my way and I contrived, amid the greatest pains, to smile. At the time I came to the realization that the cross and suffering were for me the means and education for heaven. I also had a quiet joy in my heart, for I knew that Gemma and the dear Saviour were always near me. An increasing number of such messages went to my inner understanding revealing that I was called to be a hidden victim; a victim of love and suffering for the salvation of human souls. From then on I no longer prayed to recover. In trusting devotion I put all of my worries and fears into the hands of the Blessed Mother and the Sacred Heart of Jesus. At this time my current passion was diagnosed as positive Tuberculosis, so they moved me to the TB ward called "Assumption station" because of the risk of contagion and humanly speaking, I felt in a state worse than death. The disease made rapid progress, I can not describe all that I suffered mentally and physically. Finally my siblings decided to take me home even though they could bring me no relief at home in terrible pain, but it was for me a consolation to be among my relatives. But such pain and sufferings was only the beginning of a lifelong ordeal. Added to my physical ailments there was joined what seemed to me to be a high degree of utter abandonment by God. The various torments penetrated to the depths of my soul. It was an anguish that can not be described and incomprehensible to those who have not experienced it themselves.The dear Saviour allowed that densest darkness came over my soul, and that even the thought of heaven, which was so sweet from my childhood, was an object of struggle and suffering in this time of serious illness. The duration of these trials was not limited to a few days or weeks or even months--no! Often my soul came completely off the rails.. That I have survived this difficult time I owe to the love the Heavenly Mother, the holy Gemma and the dear brother Jordan May to thank (Brother Jordan May was a German religious brother)... Gemma was my best friend, my dearest sister, my constant companion and guardian. "You shall be a preferred bride of Christ and as such you are allowed to participate in a special way the great life's work of saving souls." "I will be with you and guide you in everything, but say to the confessor that you are to be hidden, and that he should keep quiet about everything. You have to be tested in many ways and you must now also learn to take humiliations upon you." "My sorella has the wounds of the Saviour on the heart, hands and feet but they are invisible to the human eye. They are to remain hidden, like many of her other sufferings...."
Occasionally if one looked carefully, one could see visible on the surface of the hand pale blue spots. Otherwise there was no visible indication whatsoever that Mariella bore the stigmata. At times because of the intense pain emanating from the invisible stigmata there were many days where Mariella was not able to even hold a needle or a pen in her hands. "I see countless sins that continually wound My Sacred Heart. I see everywhere indifference of the masses and of many Christians. I see unworthy communions and the betrayal of some ministers of my sanctuary....Help me save sinners!" "Help me save sinners! Do not shrink back timidly before your life's sacrifice"
"I thirst for souls who agree to live my plans prepared in secret. From you I ask sufferings and because of this I draw you nearer to Me." "Love sorella (= sister) and watch constantly about yourself! Put your entire soul into the hands of your spiritual director; all your wishes, your trials, your difficulties, your dislikes, so that your whole attitude will be guided both internally and externally by obedience. Reveal your inner being with him truthfully and sincerity. And I have taken it upon myself to be also your teacher and I will not fail to give you instructions and advice in this as in all things to ensure that you are following the will of God and also our heavenly Mother." "Be at peace, my daughter, your dedication is accepted. Be a willing instrument of my Son! Let Him take you into His possession as he desires. And fear not; I will be with you and cover you under my mantle so that no one will see what you are suffering, for I want you to stay hidden." At these words they said farewell and withdrew. handed me a crown of thorns with innumerable thorns and spikes, both long and short. I was frightened and hesitated to accept this. "With Jesus, start a new life, even though you are suffering a lot. See, each of these spikes represents a new suffering for you. 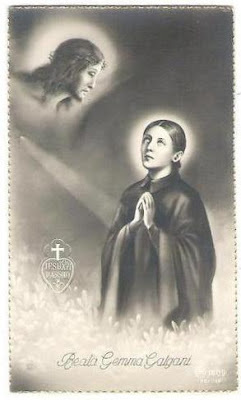 But fear not, for Jesus gives you power and grace for you to endure these sufferings with patience and resignation....Afflictions are the food of love and they nurture the flame of love...."
"Gemma always announces to me the new sufferings that I am destined for. She encourages me to accept them peacefully. She describes the crosses [sufferings] as the Savior's greatest caresses, which he reserves especially for His chosen souls. She speaks of the noble mission "Victima" -to be a victim. Yet, I feel the pathetic weakness of my current condition. I ask her to pray that the dear Saviour help me and give me a little more zeal. Gemma told me that the sufferings will increase even more because I have not climbed the summit of the suffering altitude, but that I will climb from where I am with the help of the Saviour. I suffer a lot and I am afraid to offend Jesus. At times I feel an inward disgust and everything causes me weariness and in God I cannot seem to find comfort, because it seems beyond me. The visits from heaven do not please me, because I'm afraid of being deceived. And people are not to know anything about my condition, so I do not talk about it with them. And in myself I find no comfort, yes, I understand less and less the state of my soul. It remains for me only one thing: to be devoted in this hour and then God will give me some light, for I do not oppose His divine purposes in me." "The good Lord did not give the wealth to those who have it for themselves, but for others. How much do you steal from God if you live for yourselves alone in abundance! God also calls for taxes. Anyone who has much should give a lot and donate humbly, because the gifts come from God and belong to him ... "
The souls in purgatory often came to her and asked her to pray the rosary for their intentions. The revealed to her the power of the Mass and also the holy rosary and the great help of the Mother of God for them. Some souls from purgatory would come to her and say 'receive the precious Body and Blood of Christ for my soul'. Another lesson they taught her was that Jesus sees the alms given to the poor souls in purgatory in such a way as if it were given to him. Anyone who helps the poor souls through prayers and sacrifices not only cares for the sick and helps to free the prisoners from the dungeon, but provides hospitality by helping to open for them the door to the house of our Heavenly Father. And Gemma said: "Those who help the poor souls also cloth the naked in the garments of immortal glory." "At the hands of the Blessed Mother and Gemma I entered the cemetery. At the portal stood two tall angels, each with a large book with everyone's name upon it- even my name was listed on it. The cemetery was divided into three sections. I was allowed to go into the first, because of the love of God. "This department needs your help, though here there are not many since they are very near the eternal contemplation of God"...and in this first section, I saw several acquaintances, some of them children, Father X. and brother A., 3 soldiers and several women and 5 men, perhaps. Then we went into the second division. Then said the dear Mother of God: "These are on the way to the eternal home, but the justice of God retains them, as they must be cleaned so that they are worthy of Divine contemplation. They suffer great anguish and greatly desire the vision of God. You see how there number is so great, so great!" Next the third section "The third section there are all abandoned souls that nobody thinks about or prays for. Do you hear their moans and all of their pleadings?" And I heard them calling out to us "mercy for us, mercy for us!" The Blessed Mother said, "Tell your father confessor who shows no mercy to these souls, and does not attend to them, nor seeks to help them, that God will not bestow mercy if he shall follow them into Purgatory. A court without mercy for those who exercised no mercy." This trip into our cemetery made me very sad, because I saw many of my relatives and friends among the crowd of forgotten, all still languishing. All of a sudden I saw myself lying in the grave, I saw so many who visited the graves of their loved ones. My grave stood there quite deserted. No one came to my grave, none of my relatives, acquaintances.- That made me feel so sad that I had to cry. I felt the pain of abandonment and of being completely forgotten on the part of relatives. Oh, that is indeed a suffering! On the 3rd of November Gemma was once again my companion on a trip to purgatory. I asked her, "Why do so many people go to Purgatory, and for so long, as you have shown and told me?" And Gemma replied that most people in the world live as children of the world, and they care little for their eternal happiness. Also Priests and religious who cared more for their own souls than that of their charges, are also in purgatory for a long time. 'I have shown you how in the next world that everything is atoned for and settled up'. Oh, I'm now so afraid for myself also! Dear God, who can understand the agony of the poor souls? Oh, if the people living knew! One would have to have a heart of stone if they remained deaf to the calls of the poor souls, and did not want to help them! After Holy Communion, I was led back to purgatory. The large angel standing at the entrance said to me: "The measure with which you measure will be in turn measured back to you. The souls here know of no ingratitude "
"This one suffers greatly because of the disputes with her children while she was on earth." "The living should go to the Mother of Mercy. The heavenly Mother leads out many, many souls." "You know Mariella my love, that purgatory is not only a place of justice, but also a gift of God's mercy. Would not God's mercy exceed His righteousness, so many souls were not be lucky enough to come into purgatory." "My fights with the demons are sometimes so strong that oftentimes I become unconscious. The other day there were two monsters who were constantly around me, deep into the night.. They tried to lead me to discouragement and make me lose trust. Each were yelling in my ear, one louder than the other. The more I resisted, the more brazen they became, so they turned to violence. On Thursday there was a serious fight. I was suddenly surrounded by innumerable devils. The leader was called Noes (Noah). He sat on a red horse. I was tied to it and taken through many streets, and then dragged into a dark basement. They became infuriated when I called the good Gemma for help. Immediately I heard her call them different names: Noah, Nathan, Salus, Neres and Ilsen; Ilsen and Noah were the craftiest. Suddenly my loving sorella [Gemma] was accompanied by St. Gabriel Possenti and Gerhard. The two were talking, I did not understand: "Vade" or "Vada." But suddenly Noah jumped from his horse, and they all dispersed. At night once again came an attack, but I was freed by my protectors. "My loving sorella, the heavenly Mother has been given the means to rescue the world according to the arrangement of the Most High God. The Most High will increase in these latter times the glory of His holy Mother, and He will reveal and spread her beautiful, deep and hidden mysteries to all of the world. Divine Providence has reserved these secrets until the time when the world needs these revelations the most. You should then help to make known the protection and intercession of our great Queen and Mother." With these words I saw rising from the abyss of the earth a very ugly and hideous dragon with seven heads and many other evil spirits came up and followed the dragon. They all went out together. Gemma told me that they move about in the world seeking out individual people, including priests, which they could use to execute their plans. Their plans are to work against the intentions of the Lord and to prevent the spread of the honor of Mary. They want to deprive the grace which God wants to communicate to the whole world through the hands of the heavenly Mother, keeping them from reaching the people. The malicious dragon and his followers to spread poison and smoke, so as to clothe the people in darkness and confusion, so they refrain from even seeking and calling upon the intercession of the heavenly Mother; to call upon her charity and obtain her help in their needs, and to keep them from honoring her. "Contend to fight under the banner of her name and under the banner of the graces that she has received from her Immaculate Conception!" "Every home should call upon the Mother of God, desiring Her not only to visit, but always to stay in the family. Mary understands the family hardships and has good ears and a watchful eye. There in the family where the enemy cunningly casts his nets over the children entrusted to her, she turns the nets back upon him. Mary also has a good memory and she does not forget any of her children....She does not forget the "Ave's" [Hail Mary's] addressed to her. No, Mary does not ever forget the pious Ave's given to greet Her, and said in her honor." "It is impossible for a great devotion and love for the heavenly Mother of divine grace to go unrepayed. I assure you, dear sorella, that through our heavenly mother I was always more than amply protected in dangers, and abundantly helped during the struggles. The more sufferings the world and hell would hurl against me, the more protection was given to me by her- the impregnable 'Tower of David'.